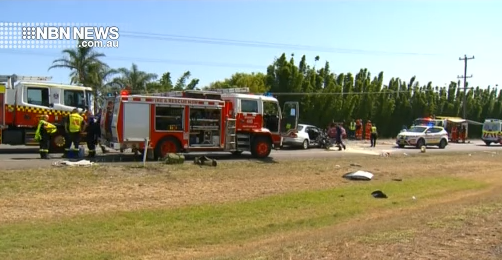 LATEST 6pm: A woman is in a critical condition, following a head-on collision at Williamtown on Wednesday afternoon. A Holden Statesman and a Toyota Echo collided on Cabbage Tree Road just after 1.30 this afternoon, trapping three people – a man and woman in their 60s, and the male driver of the other vehicle. Emergency crews worked for more than an hour to free them. The woman was airlifted to John Hunter Hospital, while the two men were taken by road ambulance in a stable condition. Police are continue their investigations. EARLIER: Two patients have been taken to John Hunter Hospital by road ambulance, while one other has been airlifted by the Westpac Rescue Helicopter. Cabbage Tree Road at Williamtown is closed in both directions, after a serious two-car collision. It’s understood three people were involved in the accident shortly after 1.30, but have since been freed from the wreckages. Multiple emergency crews and two helicopters have been called to the scene, to transport patients to John Hunter Hospital. A man in his 60s is reportedly in a serious condition, no other conditions are known at this stage. Local traffic diversions are in place – Westbound traffic is diverted at Medowie Road, Richardson Road to Pacific Highway and Masonite Road to return to Cabbage Tree Road. Eastbound traffic is diverted onto Masonite Road, Pacific Highway, Richardson Road and Medowie Road to Nelson Bay Road.